3000 years ago, king David of Israel and some of his contemporaries started writing songs; they got put in a book which today we call the Book of Psalms. 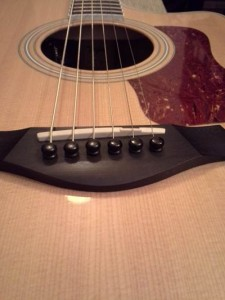 They explain how using music and singing to thank God for all he has done for us (praise) and to acknowledge His greatness, power and might (worship) is not only pleasing to God, but it is also really good for us – it is actually fulfilling a part of the role we were originally created for. Scientific studies have confirmed this showing how singing is actually good for us from a physiological perspective as it helps to regulate our heartbeat and breathing. David and his companions used musical instruments to aid their singing, Psalm 150 gives a good (although by no means exhaustive) list of instruments used, including trumpets, cymbals and stringed instruments. King Jehoshaphat used singers and musicians to lead the nation out to battle (2 Chronicles 20:21), and we know from David’s own experience recorded in 1 Samuel 17:23, music offered in worship to God has a powerful effect on a troubled soul. It is therefore no surprise to note (no pun intended!) that musical instruments have always been a central part of church life. The instruments used have varied at different times in history, but never has the church been without a song to sing (James 5:13 / 1 Corinthians 14:15 / Romans 15:9 / Hebrews 2:12 / Revelation 15:3). Today, it is common place to have a ‘worship leader’ to orchestrate things, and lead the other musicians and congregation. Paul makes the point in 1 Corinthians 14:7 that it is a really good thing to have some clarity and distinction – if anyone has seen what happens when musicians are put in a room and left unsupervised you’ll understand how important this is! Even in king David’s time, he had appointed a ‘worship leader’ called Chenaniah, who led the other musicians and was ‘the master of the song’ (1 Chronicles 15:27). In truth, no human being can be the worship leader, for true worship comes from the heart and is kindled by the fire of the Holy Spirit in each believer. It’s not just about singling nice songs or hymns (something the BBC’s ‘Songs of Praise’ has yet to understand). The Holy Spirit therefore is the real worship leader, the best we can do is to humbly and obediently seek to follow the Holy Spirit’s leading and guiding, that our worship be ‘in spirit and truth’ (John 4:23). Calvary Chapels around the world have long stated that ‘our worship is intelligent’, and this is a fitting description. It is not a sing-along, it is a personal, private, intimate time where we can bow our hearts before the throne of Almighty God, the Creator, Redeemer and Sustainer of all things. 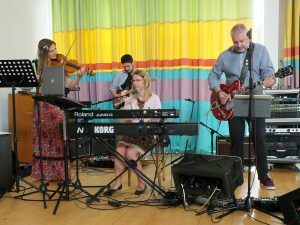 At Calvary Portsmouth our songs are a mix of old and new; old hymns for their solid and powerful Biblically based declarations, and modern choruses and songs for their simplicity, honesty and expressions of the heart. 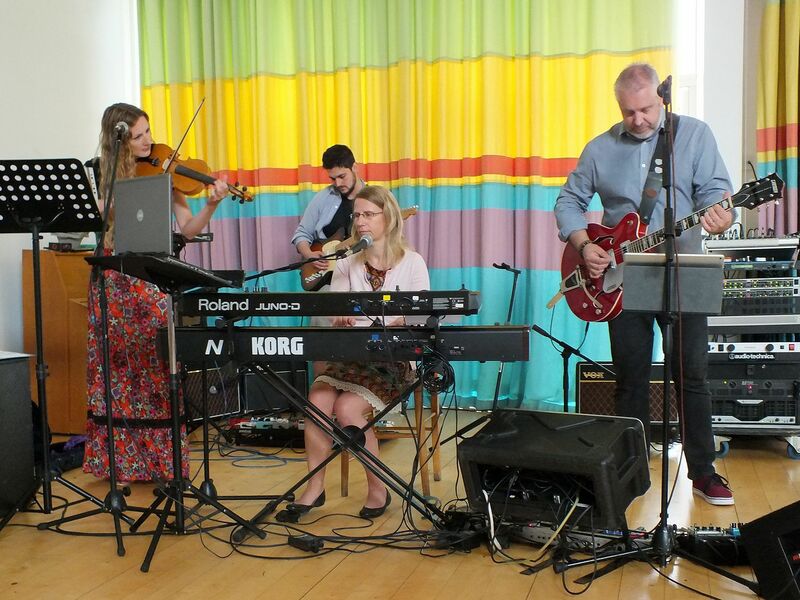 The band currently consists of keyboards/piano, guitars and drums, with violin and saxophone also used on some occasions. Pastor Barry currently acts as musical director for the band, having had over twenty years’ experience playing in a number of different types of bands, both as a drummer and guitarist, and also working for 12 years in the pro-audio industry.